The main problems of finishing gravity concentrates, including gateway concentrates, are due to the presence of a large proportion of heavy minerals and the presence of small and thin gold grades. This is the reason for the losses already recovered fine gold. At the development of centrifugal concentrators, which extract pulverized gold in CJSC ITOMAK we was faced with this problem. It was necessary to find a solution how to bring the concentrate to the golden head without loss, without resorting to chemicals. Application concentration tables and jigs are not allowed to solve this problem. CJSC ITOMAK has developed its own jigging machines and screeners. But a significant breakthrough in this direction has been made after the development and implementation of dry and wet magnetic separators, and especially the process of magnetic gravity separation. Only a comprehensive approach has allowed creating a clean installation, which allows getting the gold from concentrates without loss. The wet magnetic separator can significantly facilitate the work table and jigging. Then the table’s tails pass on the purification in the concentrator. The head table is dried and subjected to two-step dry magnetic separation. Sharing the separation steps, we increase the quality of the separation process. The instability of supplies and poor quality products forced us to independently produce a magnetic fluid, drying cabinets. 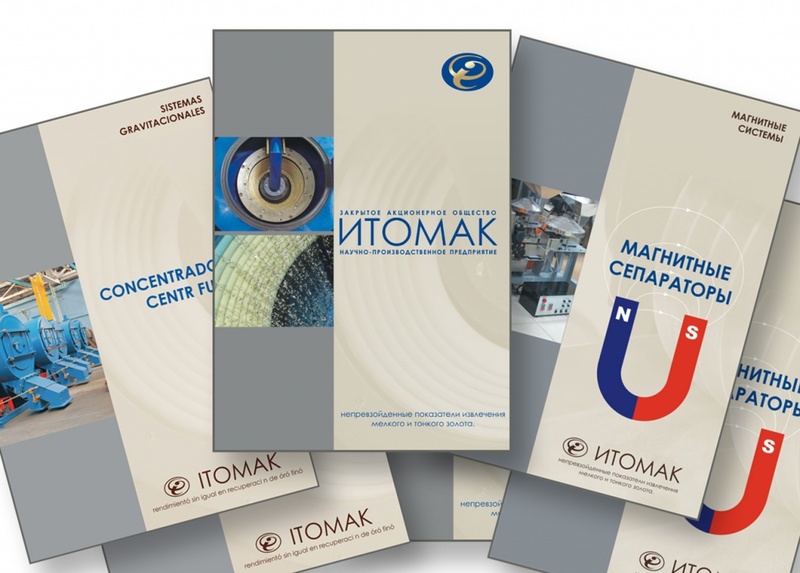 Thus, ITOMAK offers a unique, reliable, hard-working complex, which allows working in the field conditions and achieving the best results. Finishing technology ITOMAK efficiently and economically. Minimal water and power consumption, low operating costs, unmatched performance of equipment in conjunction with the full support of the manufacturer allowed us to put more than 20 complexes as enterprises in Russia and abroad. Used for finishing gateway concentrates with fine gold without losses. PROPOSAL for finishing complex "ITOMAK"
Ensuring the whole complex of equipment consumables, components, spare parts and technical documentation. So the module is ready for installation and getting started. SMS - 20M is the dry magnetic separator capacity of 20 kg of dry material per hour. The maximum intensity of the magnetic field generated by the device in the area of separation reaches 2 Tesla. ITOMAK - KN-1.0 is the compact, high-efficiency centrifugal concentrator, which allows to extract almost all the fine gold from the tails of the concentration table. SMJ-PM-3 is the magnetic-liquid, compact, high-efficiency separator allows you to share schlich gold from non-magnetic, heavy impurities (avoids purging concentrate and accelerate the process of finishing the finish). The principle of separation is based on the ability of magnetic fluids change their density in a magnetic field. MMS-2PM is a separator for extraction of magnetic impurities from ores and sands coming to magnetic separation in a slurry and to separate magnetic minerals during the mineralogical analysis and processing small geological samples. MOD-0,2SK is a jigging machine that designed to work with non-aggressive environments with depositing minerals - ore and other rock size up to 8 mm in laboratory and industrial conditions. GI-0,6 is a rumbling machine for separating the raw material into two classes by size (+10, -10) before the enrichment. SHSP-0,25-500 is a drying cabinet for drying the materials at a temperature in an air atmosphere. Designed for operation at an ambient temperature of 50 ° C to + -10˚S and relative humidity up to 80% at + 25 ° C.
Productivity on hard, t / h, max.